Scotland's deputy first minister has announced a £33m welfare fund to help the country's most vulnerable people. Nicola Sturgeon told the SNP conference the scheme would include crisis payments for those who could not afford to feed their children. Ms Sturgeon also said £45m would be spent on building 1,200 new houses and protecting 800 jobs. And she accused Labour and the Tories of writing Scots off as "subsidy junkies". Ahead of the 2014 Scottish independence referendum, Ms Sturgeon also argued for people to vote "yes". Ms Sturgeon told delegates in Perth that the £24m Social Fund, due to pass from Westminster to Holyrood next April, would be topped up with £9m to help an extra 100,000 people. She said: "Our Scottish government will not desert any of Scotland's people in times of need." 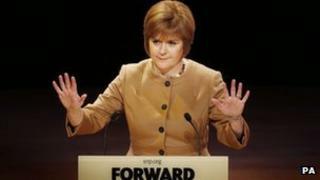 Ms Sturgeon said the house-funding package would provide a badly-needed shot in the arm for the construction sector. She also called on UK Chancellor George Osborne to use his autumn budget to aid economic recovery by boosting capital spending, which pays for projects like roads, schools and hospitals. Ms Sturgeon said: "I have a very direct message for the chancellor today, a message on behalf of every construction firm clinging on by their fingertips, on behalf of every unemployed person desperate for some light at the end of the tunnel. "Our economy needs a capital stimulus and it needs it now. "If the chancellor cares about getting growth back in our economy, if he cares about getting people into work and giving our young people hope of a brighter future, then he must listen - not to us - but to the growing band of economists and business organisations who say it is time to take a different course. "Her [Nicola Sturgeon's] objective was to argue that independence would give Scotland the opportunity to pursue policies more in line with the general instincts of her people. "Hence, her announcement of an additional £9m for the Social Fund (when it is devolved to Scotland from next spring and becomes the Scottish Welfare Fund providing emergency support to the poorest families.) She contrasted that quite deliberately with tax cuts for the wealthiest which, she said, were the concern of the UK coalition. "But of course it is not enough to attack the Tories and the Liberal Democrats. Nationalists know that in order to win their referendum they must target the large Labour vote north of the border. " "We must build our way out of recession." Ms Sturgeon went on to attack Johann Lamont, the Scottish Labour leader, for criticising a "something-for-nothing society" and Scottish Tory leader Ruth Davidson for claiming only 12% of households contribute to Scotland's wealth. Of the Ms Davidson remark she said: "What an insult to each and every hard-working, law-abiding, tax-paying citizen of this country. The deputy SNP leader told the gathering on the fourth and final day of the conference : "In the last few weeks, we have seen the emergence of a new Tory/Labour effort to write Scots off as subsidy junkies. "Now, I don't expect any better of the Tories - but what has happened to Labour? "The truth is, Scotland doesn't have a Labour Party and a Tory Party any more. "What we have is the Thatcherite Tories of Ruth Davidson and the One Nation Tories of Johann Lamont - one Scotland, two Tory parties. "Labour should be ashamed of itself." Ahead of the referendum, Ms Sturgeon warned key policies delivered under devolution, like free care for the elderly, were under threat in the event of a vote against independence. She said: "The stakes are high, but the choice is clear. It is a choice of two futures. "A future shaped by those of us who work here. A future that reflects our values and speaks to who we are. "Or a future shaped by a Westminster system that is increasingly out of touch with Scotland and the values we hold dear. "I trust - we trust - that the Scottish people will make the right choice and their answer will be 'yes'."